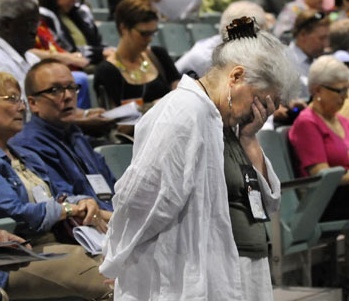 When commissioners to the 219th Presbyterian Church (USA) General Assembly left Minneapolis, they departed from a GA that achieved amazing, surprising, and unexpected results. The New York Times reported on the GA actions with a short summary that was one-third about the GA actions, and two-thirds about Jewish response to those actions. Nothing, of course, about any Muslim reactions, of which more later. The Los Angeles Times had its usual “middle ground” lead, written by Mitchell Landsberg. Notice that his focus is not on the Presbyterians, but on the fact that the report included criticism of Israel. In sports writing culture, this is known as reporting from the perspective of the home team. A week ago, the Presbyterian Church USA seemed headed for a bruising, polarizing battle over a report on the Middle East that sharply criticized Israel. On Friday, meeting in Minneapolis, the church’s General Assembly overwhelmingly passed a resolution that seemed to placate nearly everyone on both sides of the issue — a “miracle,” some said, that offered hope to those who see the Mideast as hopelessly deadlocked. Sorry, Mitch, but you missed the final inning rally by the visiting team. The big story out of Minneapolis is that this is no longer your Daddy’s Presbyterian Church. Of course, there were compromises by GA commissioners–this is, after all, a democratic body–but “placating nearly everyone”? Not even close. Approved a comprehensive report on the Middle East – its first since 1997–which calls for the following actions. An immediate freeze on the establishment and expansion of Israeli settlements in the West Bank, and on the Israeli acquisition of Palestinian land and buildings in East Jerusalem. The General Assembly got down to the hard stuff when it “approved” the report of the Mission Responsibility Through its Investment (MRTI) committee, an ongoing unit of governance that identifies corporations and businesses deemed worthy or unworthy for the approved investment list. The MRTI has compiled its list on instructions from General Assemblies in 2004, 2006 and 2008. The committee reached a compromise in its report by acknowledging “that Caterpillar has in many ways provided positive leadership to its community, its state, and the nation. It has donated considerable resources and equipment in support of local development and disaster relief at home and overseas. It has significantly improved workplace safety, acted aggressively to reduce greenhouse gas emissions, and pursued environmental conservation within its production processes. MRTI followed with a stick by “asking the GA to strongly denounce Caterpillar’s continued profit‐making from non‐peaceful uses of a number of its products on the basis of Christian principles and as a matter of social witness. The MRTI also “calls upon Caterpillar to carefully review its involvement in obstacles to a just and lasting peace in Israel‐Palestine, and to take affirmative steps to end its complicity in the violation of human rights. This carrot and stick compromise was reached by the GA to avoid the dreaded step of “divesting” from Caterpillar. It is pretty clear that BDS has its avid backers within the church, but they are still in the minority. For that reason, compromise was inevitable. Denouncing, however, keeps CAT on the hot seat, provoking one commissioner to comment to a small group that since CAT would not go bankrupt if it lost Presbyterian investments (hardly), why not just go ahead and divest and leave the Peoria, Illinois-based company alone. The answer, I suspect, lies in the reluctance among Americans to use economic tools against an “ally”–as opposed to, say, Iran, North Korea, or Cuba, you know, our “enemies”. The Jewish-Christian dialogue paradigm is too deeply rooted, so far, to overcome resistance to the use of BDS as a tool to confront an “ally” on a justice issue. Resistance to BDS is not strong in, for example, Great Britain, where the Methodist Church just approved a boycott of settlement products, of which there are many in the UK, especially produce. In France, a major labor union just agreed not to work on Israeli projects. These are clear signs that the old ark is a moving. Because BDS is gaining such worldwide acceptance, the Hasbara has increased its campaign against those US churches which threatens to break ranks. It has not been totally successful. The Northern Illinois United Methodist Conference, for example, recently voted to divest from Caterpillar. The pressure on the Presbyterians was felt at the GA during consideration of Kairos, a Palestinian theological document approved for study by the GA. Through some parliamentary moves that would have made Nancy Pelosi proud, the GA agreed to approve the Kairos document, and send it to local churches for study. At the same time, the GA did not approve a section of the Kairos document that advocates BDS. GA approval, however, sends Kairos to local churches, where the full document, including the BDS section, will be available for study. Will every church look carefully at BDS? Some will, some won’t. It is important to note that the Kairos document was developed by leaders of the Palestinian Christian church bodies. It is a theologically-based request for justice and peace in Palestine. One letter to commissioners sent by a coalition of US Jewish organizations, was harshly critical of the Kairos document on theological grounds. The coalition dismissed Kairos as a statement written “by a few Palestinian Christians”. A principal author of Kairos is Mitri Raheb (right), a Palestinian Christian, who is the pastor of the Evangelical Lutheran Christmas Church in Bethlehem. 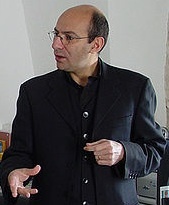 He is founder and president of the Diyar Consortium, a group of Lutheran-based, ecumenically-oriented institutions serving the Bethlehem area. Raheb was in Minneapolis to speak to commissioners. He earned his advance degrees in theology in Germany, first at Hermannsburg Mission Seminary (1984) and then at Philipps University in Marburg, Germany (1988). I am talking here about the GA’s overwhelming vote to demand a revision of a Jewish-Christian dialogue study paper because it lacked sufficient Palestinian Christian input. I interviewed one commissioner who agreed with me that this story is significant, but she figures it is too “in house” to be important to anyone outside the denomination. I think she is wrong. What happened to the Jewish-Christian dialogue study paper is nothing less than an ecclesiastical tectonic shift in the history of the Presbyterian Church (USA). It all started two months before the GA met. An unexpected overture arrived in “Louisville”, the Presbyterian Vatican located far from either the east or west coasts. The surprise overture was from the San Francisco Presbytery. It proposed that two study papers be revised before approval for use in local congregations. One was the usual Jewish-Christian dialogue paper; the other was just starting its development, a Muslim-Christian study paper. The overture from San Francisco just made the filing deadline, but it was in time for Louisville staff to have to open up consideration on both papers. And that meant the list of authors would have to be made public for discussion in committee. Alert members of the Israel/Palestine Mission Network (IPMN) realized that the Jewish-Christian dialogue paper’s authors were less than representative of the entire denomination. Only a few Palestinian Christians were included, none now resident in Palestine itself. Process–a favorite Presbyterian term–kicked in. By the time the GA received the San Francisco overture, it had been divided into two parts. The Jewish-Christian dialogue paper was rejected and sent back for further work over the next two years. The Plenary delegates agreed that the paper needed further work “around a larger table”, one that gave more representation to Palestinian Christians. The Muslim-Christian dialogue paper is still a “work in progress.” By a vote of 548 affirmative; 129 negative, and 4 abstentions, the paper was affirmed and sent out to the churches. Changes and vote totals are here. This paper will take its place alongside older, well worn Jewish-Christian Dialogue study documents. Two years from now a revised Jewish-Christian document could be available, reflecting a more Middle Eastern perspective. That is when the ecclesiastical tectonic shift rumbled through the horse farms of Kentucky. The 219th General Assembly overwhelmingly chose to reach out to its Muslim co-religionists, in defiance of a still prevalent bias against Islam in American culture. This shift shakes up the Jewish-Christian dialogue paradigm which has controlled American Protestant understanding of the Middle East since the 1947 creation of the modern state of Israel. The paradigm was, from the beginning, designed as a neat “Us Christians and Us Jews” fighting for survival against those “Others”, outsiders, Muslim Arabs, who not too long ago were called, by Westerners, Mohammadens, (Saracens in Medieval days). Few Americans knew, until recently, that there is a rich history of Muslim-Christian interaction dating back to the start of Islam in the deserts of Arabia. The Presbyterians knew, which is why at the 219th General Assembly, they sent to their churches a plan to study that rich history which will enable them to start interacting with their Muslim neighbors on a more positive footing. It will be that dialogue which will break down walls in American life, walls already under attack from creative funny man and philosopher, Jon Stewart, who skillfully turns bigots against themselves in a recent Comedy Central segment. Click here to hear from Stewart. The photo above of a GA commissioner standing in prayer was taken by AP’s Jim Mone. It was printed in the LA Times. This entry was posted in Middle East, Middle East Politics, Religious Faith. Bookmark the permalink. What a brilliant analysis and conclusion!!! I agree totally with your perspective. Thank you so much for your amazing insights and for bringing hope to Christian Palestinians like myself. The Israel/Palestine Mission Network deserves enormous credit for the sea-change in the General Assembly’s decisions. Through painstaking, sensitive, and timely research and the distribution of its findings to Presbyteries and General Assembly Commissioners, the IPMN helped the whole church understand the Middle East better. They also broke the earlier reliance on documentation made available by individuals and groups that were partisan to the settler movement in Israel. Commissioners to the 2010 Assembly deserve credit, as well, for standing up to claims that to support for Palestinian Christians and open-minded Israelis is anti-semitic. The irony has long been that there is more open discussion of a range of options in Israel that some leades of the American Jewish community are prepared to hear in the United States. Jim, you’re absolutely right that this is a huge development that hasn’t gotten the attention it deserves. I’m so glad you posted about this, I had no idea. One giant step forward for genuine interfaith reconciliation and justice work, one giant blow to the facade of “interfaith dialogue” that is used to prevent any consideration of Palestinian human rights and the growing Jewish voice for justice and peace. Jim: Thanks for your very sound report on the 219th Presbyterian Church(USA) General Assembly. Your conclusion that the General Assembly’s choice to reach out to the Muslim co-religionists in defiance of a still prevalent bias against Islam in the American culture should be very helpful for all us. As always, we appreciate your good works. Nice political analysis. But has little to do with Christianity. which probably applies to most of what went on at General Assembly…. Your story is informative and gives hope for change. It shows that overcoming ” the powers that be “, that aim to misinform and disinform, the powers of darkness, can be overcome by powers of ” sweetness and light “. Your story gives hope.